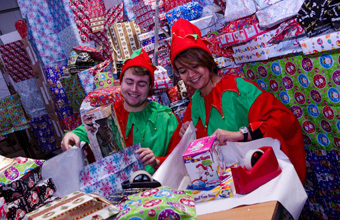 A GROUP of elves have been hand wrapping more than 25,000 festive gifts at Longleat. The gigantic gift wrapping exercise began back in October as staff at the Wiltshire attraction prepared to welcome thousands of excited children on board their Santa Express to meet Father Christmas. The resulting present mountain was so large it had to be stored in a separate warehouse before being transported out to Santa's Grotto, where each present was individually addressed to a specific child in readiness for their meeting. Longleat's Steve Mytton said: "Christmas really does come early here as we have to start the wrapping process in early October to ensure we have all the presents wrapped and ready. "Generally the ages of children who meet Santa is from little babies to young teenagers, however we have had special requests for people up to the age of 70 to receive a gift from Father Christmas!"